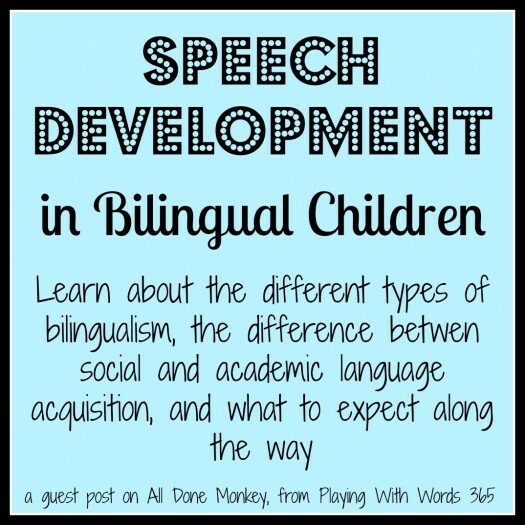 As a speech language pathologist, I am asked all the time about language development in children raised with more than one language, so I was thrilled when I was given this opportunity to share some information on this subject on All Done Monkey, a great blog written by a mother raising her children to be bilingual. The post went up on Monday, and you can check it out on the blog HERE and leave me a comment…what do you think? Mrs. Katie, you are really so great in explaining your craft. I had it understood here more than when I went to speech therapist. By the way I raised my son in bilingual language, Greek and English although English is not my native tongue. I am raising a bilingual child. My daughter just turned 8 months. My husband and nanny speak to her in Albanian and I speak to her in English. I was wondering if there is anything I should do differently to help her learn both these languages. I am worried that she will not be able to speak both fluently. Is there any advice on how to ensure fluency in both languages? Our child is struggling with three languages – English, Arabic and Russian. He’s approaching 4 y.o. and unfortunately none of the 3 languages is “formed”. It’s very alarming as we live in a developing country where none of the 3 languages is native and the speech therapists do NOT exist. Any advise on what to do? Thanks. Trilingualism is a toughie, and it is hard to give you real advice without seeing the child. I have seen children grow up trilingual with NO issues, while others struggle. I know that Tatyana from Smart Speech Therapy LLC knows quite a bit about multilingualism and you may want to check out her blog for more info. Good luck! my son is three years old.. our native language is different and we watch tv in hindi and english. his kindergarten is in German and English. so basically he listens 4 languages. He is still unable to make sentences in any one language. he understands, also he knows all colors, shapes, alphabets, digits,and at 2.5 years can arrange A-Z when given to him alphabets in random fashion . so is the case for 1-20. Hello Katie, I stumbled upon this blog a few days and absolutely love it! Thank you for all the useful information. I especially loved your post about bilingualism, because my husband and I (Spanish speakers) are raising our 5 month old daughter in Germany. If you find the time I would LOVE to read some practical tips from you about raising bilingual children. Our main concern is that she rejects our language, as it isn’t needed with her peers.